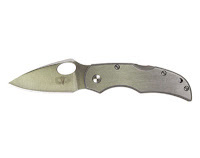 Smith & Wesson manufactures a button lock knife that is very similar to the Boker Magnum. The Smith & Wesson 50 series comes in two colors, black and champagne (silver). They are both constructed of high quality aluminum handles with very nice handle grips in the form of three indentations lenthwise down the handle on both sides. This provides a lot of gripping surface. 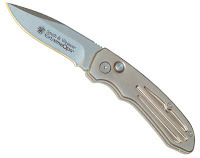 You can also purchase this knife in a couple of different blade formats. Most notable, either a plain edge or a serrated edge. You can also, if you search hard, find it with a tanto point instead of a drop point. Obviously, the tip of the knife is just a preference of the user depending upon what they will be using their knife for. Although I typically lean towards a tanto point, in this particular model, for whatever reason, I prefer the drop point. It may just be that I like the look better on this knife. This knife, after being converted to an automatic, snaps out hard and locks up tight. I am sure you are sick of hearing me say that about automatics, but I hate an automatic knife that barely snaps out or wiggles after it is supposedly in the lock position. To release the blade, you merely push the button and then you can fold the knife back up into the closed state of being. The S&W50 also comes with a nice belt clip that is removable if you so prefer as well as a pretty solid slide safety on the spine. 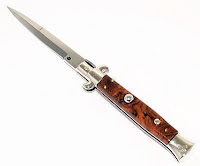 This is the knife’s biggest weakness if it has one. The safety doesn’t lock up really tight and sometimes will slide on you just a little while it is in your pocket. Not a huge deal to me, but it is something to think about. It comes with an extremely sharp 440 stainless steel blade which is, as I said before, a most excellent shape. Smith & Wesson has kept up the tradition of excellence with this wonderful button lock automatic conversion. Remember, this knife has been converted to an automatic post production line. 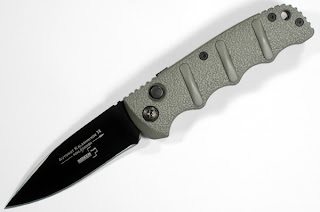 Smith & Wesson doesn’t make them as automatic knives originally. This knife is a great all around, everyday carry knife. Get one today, you won’t be disappointed! I rate this knife as a 9.25 out of 10. I have never really been super crazy about Frank Beltrame’s knives. I prefer the military slant to knives and most of his seem to feature elk horn, ivory, or some other natural substance for the scales. All well and good if you like that kind of stuff. And I will admit, some of them are very beautiful products. It just isn’t my favorite kind of thing. I would much prefer G-10 scales or some other “military” type handle for my knives. Now, don’t get me wrong, Frank B makes great knives. They are all top notch quality construction and hold up great under normal wear and tear. All of them, that I have seen, use top quality materials. 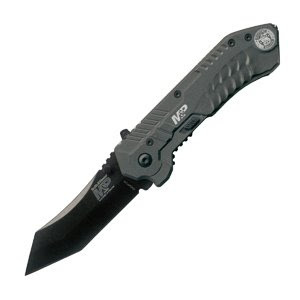 Enough with that, let me just say, I was ecstatic when I found this tactical military k nife by Frank B. It has all the earmarks of his products, great materials, strong craftmanship and a nice tight feel to the knife. You know it is one that will last. 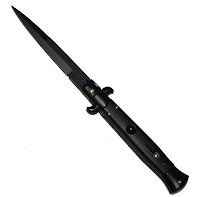 I love this stiletto knife. The nice thing is, if you prefer another look, there is another one available on our website. It has beautiful faux briarwood scales which are very nice. In my spare time, I do woodworking. And I really do, contrary to everything I said before about alternate materials for the handle scales, like the look of this particular stiletto. They both have nice, tight safeties that aren’t going to slide around on you when you least expect them to. They both have very strong springs that pop the blade right out. And finally, they both look great. Try one out if you have been looking for a high quality stiletto. Frank B has done himself proud with these. SOG recently, a few months back, came out with a new series of knives. Just a couple of weeks ago they came out with the mini version of the same automatic knives. 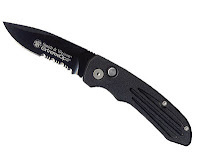 These auto knives are extremely good tactical, all purpose knives. They come in a few different variations. SOG has made the 01,02, 03, and 04 as well as the 10, 12, 13. These knives are sharp, have strong action out of the knife, and they are thin. This is one of my favorite things about the knives, they are long, but their very thin profile make them easy to carry. Once open, each of the auto knives lock up tight. 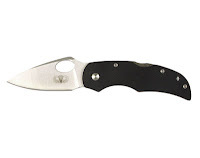 They are made from quality materials, the handles are made from machined 6061T6 hard-anodized aluminum and are inset with G10 type textured inlays. The blades are beautiful. This is a series that I would like to own the enire set. SOG has hit a home run with these knives. This is one great series.